Tender but Crunchy Asparagus on Sunday Brunch to fight the hang-over! Asparagus is in season at last in the Pacific North-West. I have been wanting to replicate the fine local fresh asparagus I ate in Provence at my brother’s about a month ago but my experiment with Mexico grown spears was not even close. Today though I found some asparagus from Washington state (they produce over a third of the US crop) and I am ready to give it another shot. There are three little tricks I use. First the North-American tradition is that you do not cut the ends off but instead that you break them off the stalks. Not 2 inches, not 3 inches, but exactly where they will break off easily when you bend the stem, sometimes one inch and sometimes 4. Only the tender part remains. They don’t know this in France, so they were impressed by my technique. 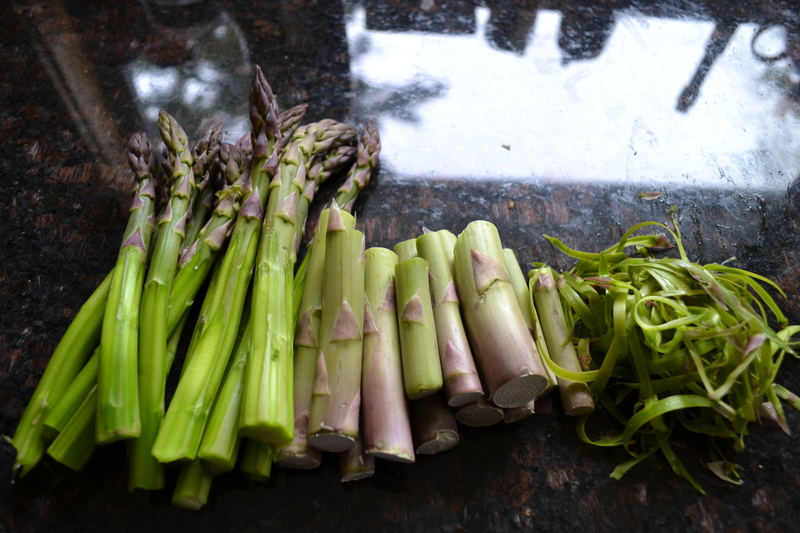 But then, I was rather surprised when my brother started peeling the green asparagus, as I would have only peeled the white asparagus variety. He took the time to do it with a potato peeler and that was well worth it. 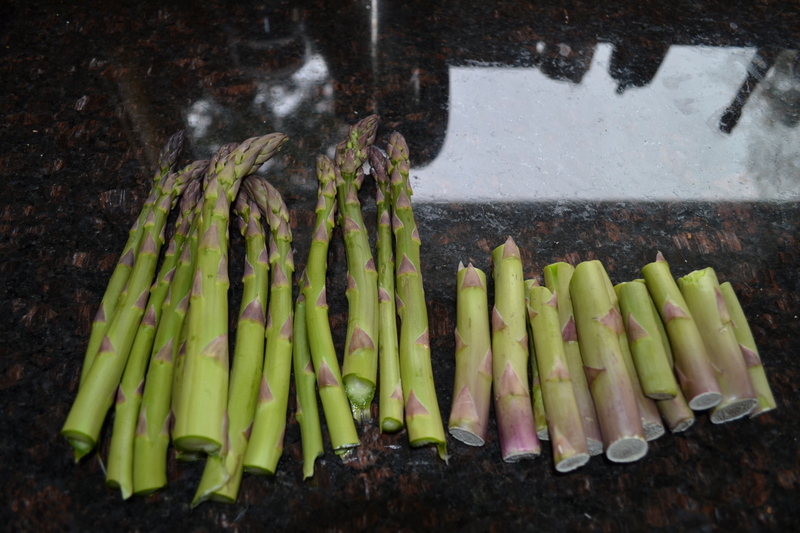 The last thing is the cooking, there is no set time, the asparagus can be grilled, steamed or blanched. If you blanch them, use lots of salty water and 1/4 teaspoon of baking soda to help keep them bright green, then drain quickly and let the steam off. The key is to not overcook, so stand by with a knife to check often after 5 minutes of cooking. Because of how well they were prepped, the asparagus need less cooking time. An asparagus cooker is not necessary, I use a frying pan. Asparagus have a strong unique taste and I find it best not to add dressings made with olive oil, tarragon… or Hollandaise sauce. I usually make a simple vinaigrette with peanut or canola oil, Dijon mustard and fresh lemon juice with salt and pepper. This asparagus salad is good warm or cold. 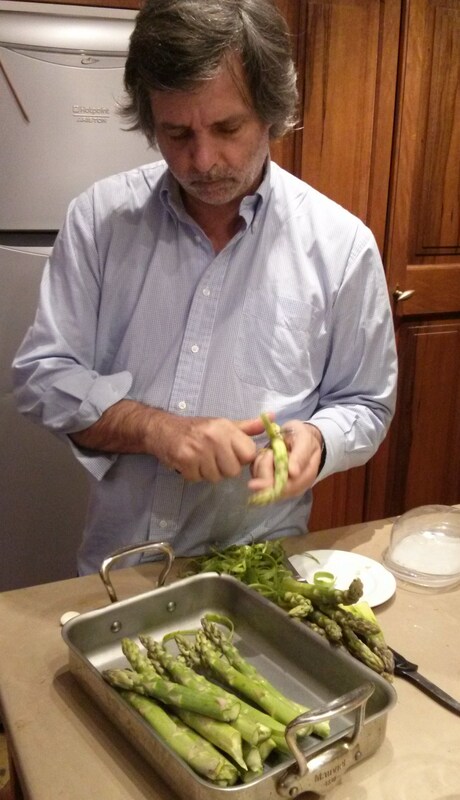 French people cut the ends with a knife and at home they eat the asparagus with their fingers. The result is a woody stub left over on the plates from the part that has too much fiber to eat. The French asparagus though has a far superior taste, especially in Provence. 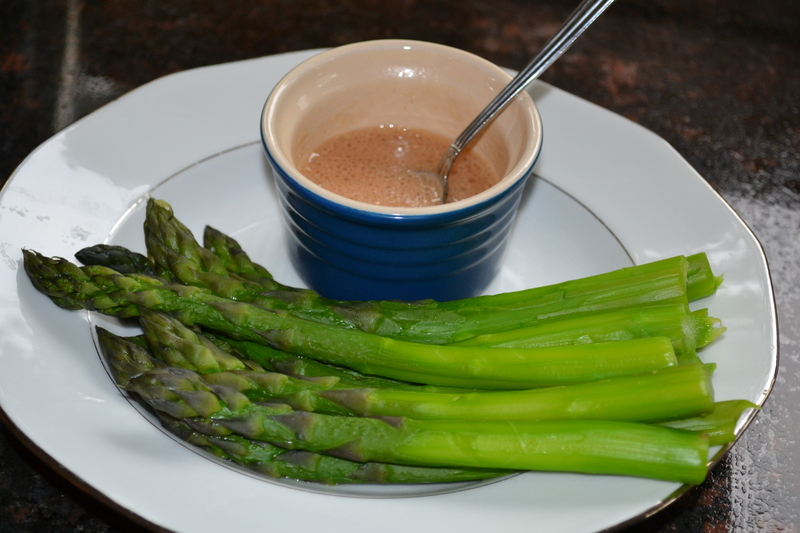 Asparagus is very healthy, it provides good Vitamin C, B6, folate, potassium , iron, fiber. It is a diuretic good for uric acid. It is low-calorie and said to be effective to help gout and hangovers! The asparagus boosts the enzymes that help break down alcohol. Might be a good idea for Sunday brunch! This entry was posted in Appetizer, Vegetables, Vegetarian and tagged Asparagus, food, recipes, verygoodrecipe. Bookmark the permalink. 3 Responses to Tender but Crunchy Asparagus on Sunday Brunch to fight the hang-over! When I had a garden my asparagus patch was very busy in the Spring. The more I cut the new shoots the more the plants produced. 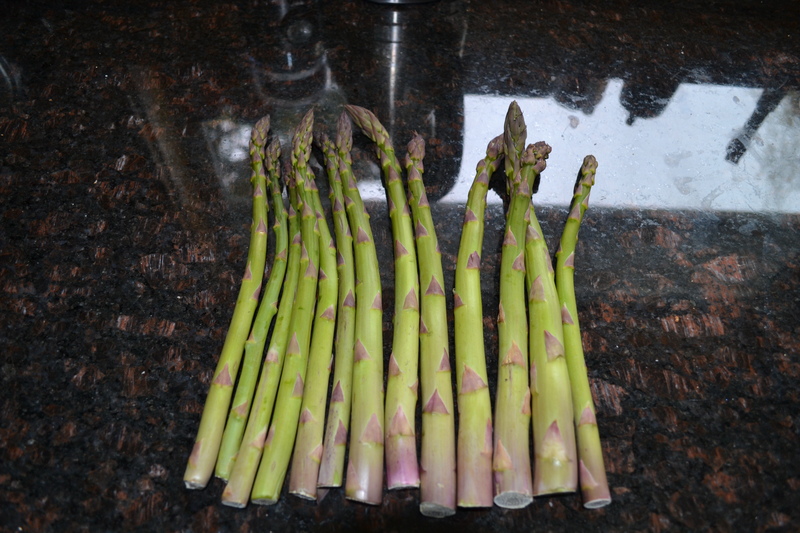 Now the snow has finally gone I am looking forward to finding the local asparagus at the markets. Laura has rhubarb in her garden and soon I’ll be there to cut some of the new shoots. Such a joy to see local produce !! We are looking forward to hearing about your coastal trip coming up soon. I always enjoy reading your new entries. I always peel my asparagus. It takes a few minutes, but the texture is much better that way. I often toss them with a bit of oil, roast them in a hot oven (400 F) for 20 minutes or so, then sprinkle them with parmesan and continue cooking them a bit longer until they are crisp and brown and sprinkle some fleur de sel. Great side dish and also wonderful to nibble on, eaten with your fingers. I recently moved here and I am wondering if there are good local asparagus in season. Bonjour Ann, I am not sure where you live in Canada, but there should be some good local asparagus in many areas. I remember we got great produce in Ontario from the farms outside Toronto. And now there is the Van Treight farm on Vancouver Island, their stuff at “The Root Cellar”. Also the Fraser Valley is a great garden and Vancouver always gets good stuff. Season here should be starting any day. A bit late, it’s been cold and rainy. Your recipe sounds amazing btw!